When Georgia and Auburn get together, there is always a lot on the line. This year is no different. Auburn is 7-3 for the season, after starting out 5-0, and ranked number 25 in the AP poll. Every meeting since 1991 has featured at least one of the teams ranked in the national polls. They would like to stay nationally ranked for their showdown with intense rival Alabama two weeks after the Georgia game. The Tigers will be playing their 11th straight game without an open date. The Bulldogs on the other hand are not nationally ranked, and are not even bowl eligible at this point. A victory over Auburn would put them in a holiday classic, thus extending their bowl streak to twelve consecutive seasons. It would also give Georgia, who is 5-4 for the season, a tremendous lift in the confidence department as they finish out their season with Kentucky and the hated Yellow Jackets of Georgia Tech. Both the Tigers and the Bulldogs are 3-3 in the SEC. 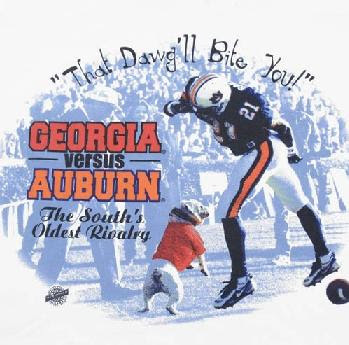 Auburn leads oh-so-competitive "South's Oldest Rivalry" 53-51-8, but Georgia has prevailed in the last three contests. Georgia is a surprisingly early 4.5 point favorite for Saturday's 7:00 P.M. tilt being played "Between the Hedges" in Athens.